Annette helps her clients communicate in black and white. She works with cultural organisations and creative providers to amplify their impact on their audiences. An experienced communicator, she’s all about the big picture and adding strategic value. The bottom line is creative, engaging campaigns that your audiences see and hear, loud and clear. Use dancers instead of powerpoint! I know this is 10mins long, and about science, but SOOO worth it. Watch this now! Simplicity has never been more powerful. Interesting little article here on distilling your message to as few words as possible. A really useful manual from our national tourism development agency… I would say that, having contributed to it : ) Download it here. Recent UK report dissects the digital arts audience for the first time. Read about it here…. Dance Ireland has announced details of Dance Ireland 21: Still in Motion, a year-long programme of dance events to celebrate 21 years of dancing in Ireland. 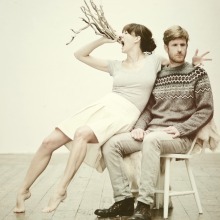 From January 2013, Dance Ireland is highlighting the vibrancy of the Irish dance community through a programme spanning live performance, film, photography, talks and more. It all kicks off in January with “Made in Dublin”, a special season of new dance performances at Project Arts Centre and the Abbey Theatre, all of which were created or developed by national and international artists in DanceHouse over the past six years. With the spotlight firmly on the upcoming generation of European dance makers; Made in Dublin is a week of full-length dance shows, extracts and “first looks”, by artists from nine European countries, including Ireland. Check out the programme here. I understand the importance or maintaining and protecting your privacy and will not sell or rent your personally identifiable information to anyone. Information we hold about you is used to monitor the use of the annettenugent.ie site and to keep records of traffic flows to the site. This may be by using a “cookie” or small piece of information stored on your computer’s hard drive by your browser. The cookies used contain no personal information that could be used to identify you. It is possible to configure your browser so that cookies are not used automatically but this may prevent you from having the benefit of some of the site’s features. I work closely with other organisations and individuals to perform functions on my behalf. Examples include sending postal mail and email, and customer service. They are provided with personal information necessary to perform the task and may not use it for any other purpose. Personal information will only be released by Annette Nugent when we believe it is necessary to comply with law. This site includes links to other sites which I consider may be of interest to you. Annette Nugent cannot and has not reviewed all of the sites linked to this site and cannot be liable for their content. Users link to other sites at their own risk and use such sites according to the terms and conditions of use of such sites. By using the annettenugent.ie website you consent to the collection and use of your information as described in this policy. The material on this site is given for general information only, and does not constitute professional advice. You should take specific advice before taking a course of action as I do not accept directly or indirectly any responsibility for loss arising directly or indirectly from reliance on information on this site. Given that the Internet uses an open system I cannot warrant that the site and downloads reach you virus-free. You must, therefore, take all appropriate precautions for your own safety.